While battling poverty incidence, Indonesia is also confronted with two interwoven rudimentary challenges, sustained economic growth fueled with prevalent income inequality. Henceforth, the Government had intervened by executing redistributive policy through the inclusive growth strategy by social expenditures provision in the form of social assistance spending and education support spending (BOS Program). Nonetheless, little has been proven empirically concerning the effect of social expenditures to economic growth and whether such spending can be categorized as pro-poor growth and inclusive growth strategy in the Indonesian context. 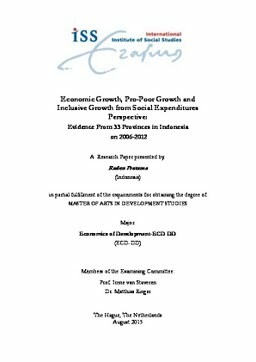 Against this backdrop, this paper attempts to shed a light in this area by employing regression analysis through the Fixed Effect Model to investigate the effect of social assistance spending and education support spending (BOS Program) to economic growth in 33 Indonesian provinces from 2006-2012. After identifying the type of social spending which is able to stimulate economic growth, this paper then tries to determine whether such social spending can be categorized as pro-poor growth and inclusive growth instrument in the context of its efficacy on poverty alleviation and human development improvement respectively. The result suggests that only education support spending (BOS Program) that statistically significant in uplifting economic growth level. Furthermore, closer investigation indicates that this particular spending can be classified both as pro-poor growth and inclusive growth instrument.